Hi! I’m Bentley, the world’s most lovable Cavalier King Charles Spaniel! My website is all about Cavalier King Charles Spaniels for the people who love them. The Cavalier King Charles Spaniel Breed has a long history. Do you know there are four colors of Cavalier King Charles Spaniels? They have been beloved pets of Kings, Queens, Presidents and Prime Ministers and are owned by numerous celebrities today. If you’re considering a Cavalier King Charles Spaniel for a pet, you will want to be aware of common Health issues. You can find information on hereditary weaknesses and illnesses common to this breed in my website. To raise a healthy pet, one of the most important considerations is Feeding. Beyond the basic guidelines for canine nutrition it can be difficult and confusing to choose a healthy dog food for our Cavalier. I’ll share some thoughts on healthy choices for dog food and treats, and provide videos and information about Life’s Abundance products I recommend. But there’s more to Pet Care than just dog food. You’ll find guidance and videos here on how to groom our Cavalier King Charles Spaniel, including giving your dog a bath, cleaning his ears and teeth and first aid tips. For Fun, I’ve got some videos of my best friends, dog quotations, and more. 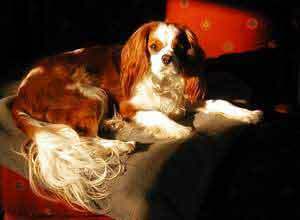 When you’re truly sure the a Cavalier King Charles Spaniel is the right dog for you, then read my pages on Buying a Cavalier. You’ll find guidance on how to determine if you’ve found a reputable breeder of Cavalier Spaniels and checklists for preparing to bring your new puppy home. Please checkout my blog articles on a variety of topics. I’d love to hear your comments about your Cavalier King Charles Spaniel!